Getting to age 43 before you finally succumb to the bite of an ACE™ bandage fastener is somewhat gratifying. What was a little disappointing about the event: learning that there isn’t a sniglet for that nasty little object. “Fastener” doesn’t do it justice. The photo above (thank you, Jen R. for allowing me to copy it via a Creative Commons license) does a great job of illustrating just how sneaky and nasty these little buggers can be. I nominate “caerbannog,” in homage to the Killer Rabbit from “Monty Python and the Holy Grail”. Deceptively small and well-designed. Has a nasty bite! And so the tip of my left middle finger –with its Band-Aid– lifts in salute to the winter of 2013’s brutish attitude my outdoor endeavors. I am on the mend, showing some progress in recovering from the heel injury – now diagnosed and treated as plantar fasciitis. My January fall on the driveway ice, however, has dealt a blow to my right shoulder, which didn’t really bother me a whole lot until I first tried to swim, earlier this week. Backstroke usually feels so darn good! Not on Monday. I likely need to resurface and use the exercises given to me a few years back for my last shoulder separation injury. Add to these the upper body soreness from an hour or so of shoveling, yesterday morning: we got 9+ inches, by nightfall. The weather provided a rare opportunity to ski to work, as it took awhile for the city to address the snow volume with plows and salt. 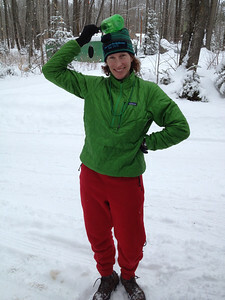 I skied through heavy, sometimes dirty snow for 50 minutes with Steve, downhill, then alone for an hour, uphill, stopping partway along the return trip at a Rivergarden Yoga for some much-needed asana, courtesy of Ted. Tip: Garudasana, especially the arm component, feels GREAT on those shoveling muscles. So did Eka Pada Rajakapotasana, but that almost always feels good. I got in bed feeling even more tired than I did, 10 days ago, after skiing the Kortelopet! And so, I slept really, really hard. Boom. Spring is just around the corner. Tonight’s plan: knitting class.